I attended Stitches West this past weekend, I am fortunate that it is held just about 1.5 miles from our house, score! I did not really have a huge list of any yarn I needed in particular this time, seeing as I have so many baby related projects I am already working on or already have ready to go. So my shopping purchases were limited, but I did come across this beautiful tweed-esque style merino/silk yarn by Mountain Colors called Twizzle in Wild Horse. (Ravelry Yarn Link). 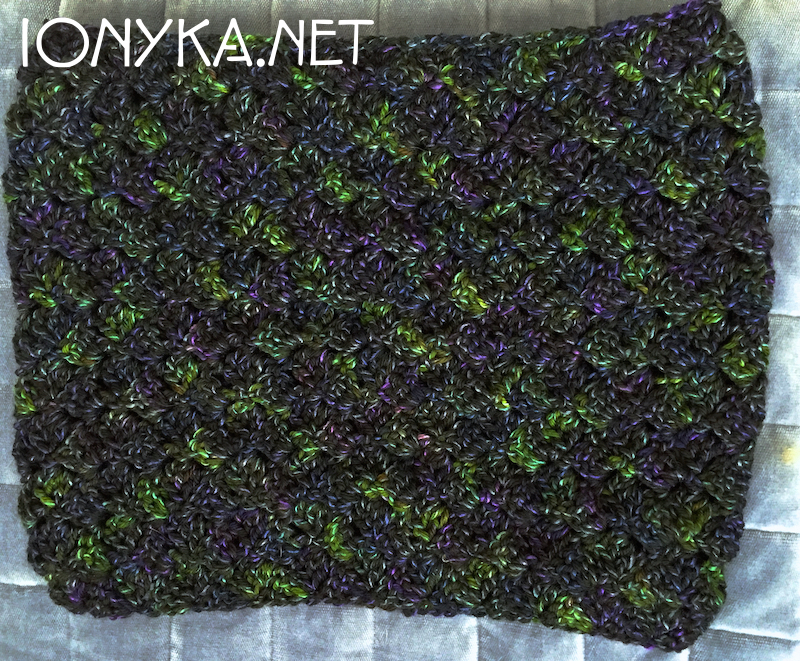 I was in the market for some dark colored yarn to may myself a cowl since I have not made anything for myself lately. I wanted something that would go well with black, navy blue, gray, etc, and good all around multicolor darks. This yarn jumped out at me right away so I had to get it! I wanted a simple pattern, something that would work up quickly but not be too stiff once I was done, I wanted it to drape a bit. 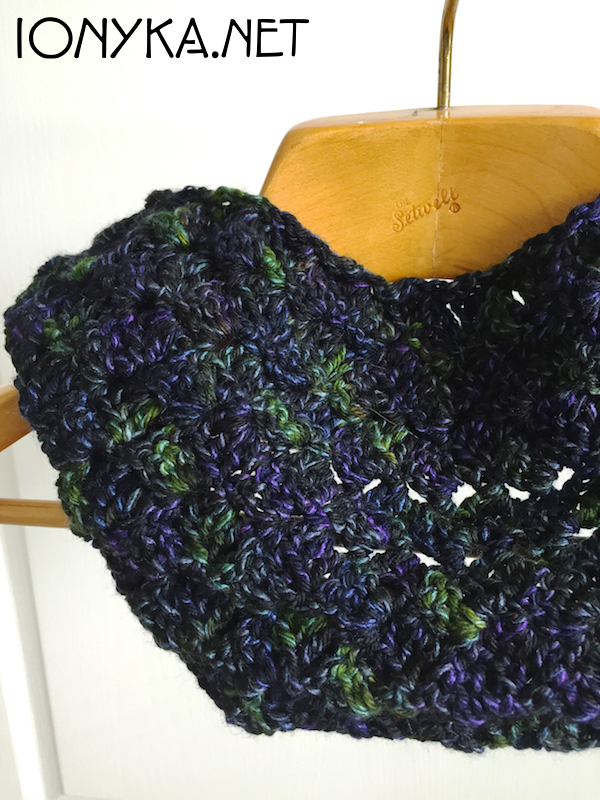 So I opted to use the Spring Petals pattern that I’ve used previously but turn it into a cowl. I used a 5.5 hook and started with a chain 50. The pattern uses a repeat of 5 so it is easy to adapt to any width desired. 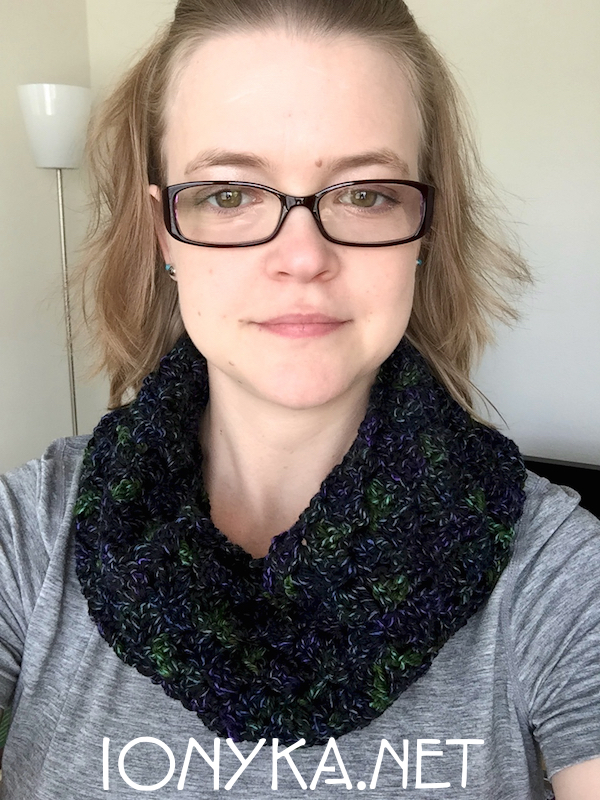 I got to work, and after I was almost out of yarn, I quickly realized it was a bit too short, or skinny if I stitched the ends together where I was, I did not want it to be that tight around my neck. I probably should have only chained 40 to start, doh! Seeing as I did not want to frog it all the way back to the very beginning, I began to figure out how I could still make this work. Since I knew I only needed about 2 more inches to make it the length I wanted, and being too adamant about not undoing the entire thing, I chose to improvise with 3 rows of hdc on both ends using just a plain black yarn I had. 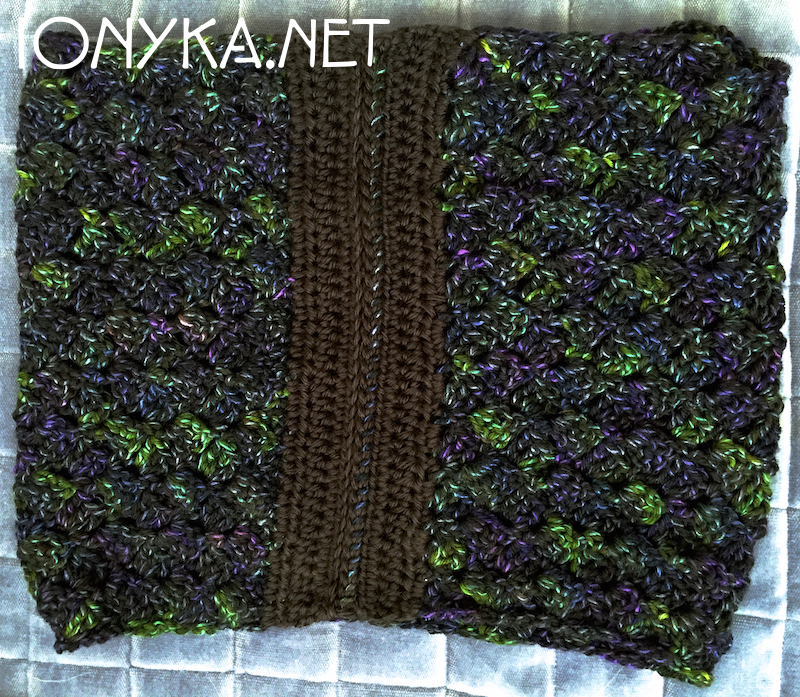 I then slip stitched those ends together and voila, my cowl was done! I ended up having about 5 inches of this yarn left, so I barely made it! I put the black band at the back of my neck when I wear it so it does not bother me one bit. I love the colors, they are exactly what I was looking for too. A great little weekend project, now its back to working on my Chevron Blanket….which I am thinking is around halfway done-ish :) Still so much to do! 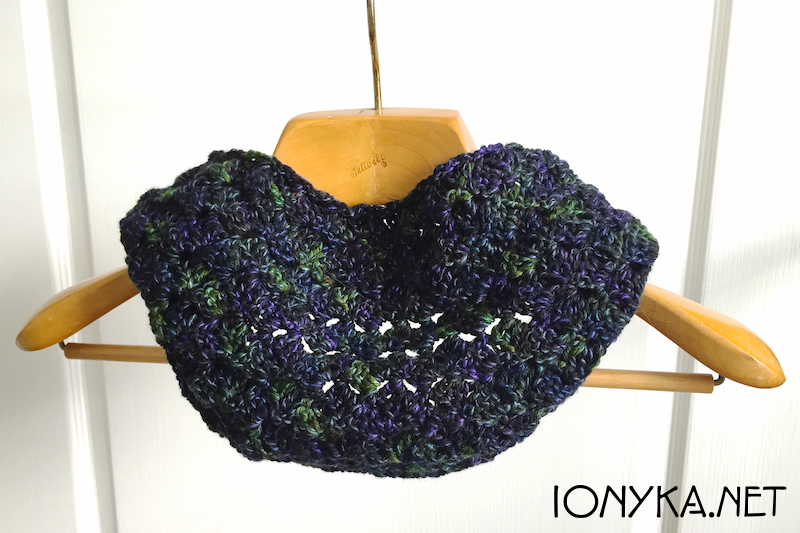 This entry was posted in New Project, Patterns, Project Update and tagged cowl, mountain colors, spring petals, stitches west, twizzle, wild horse by ionyka. Bookmark the permalink. Thanks Ionyka for explaining the process. You write like I do, telling the whole story –the background, inspiration, problem, thought process, and in your case a lovely solution. I am typing this as I wedge a skein of Mountain Color Twizzle, “Harmony Dusk” between my keyboard and forearms! I like the drape of this pattern.